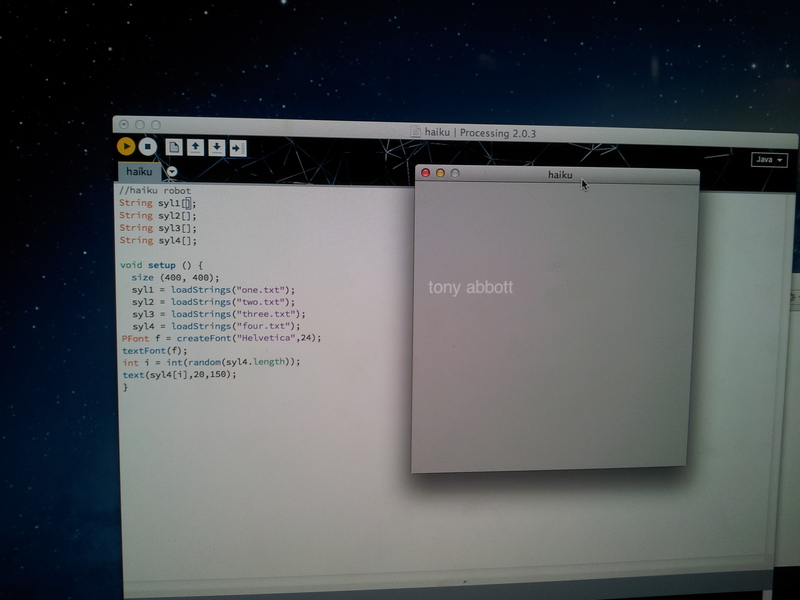 Tony Abbott… it was depressing and short, but I guess it got the job done. One of the places that always forces me to reflect is a crowded room full of strangers. Earlier this month I found myself at the Opening Night do for the Brisbane Writers Festival. It was very intimidating- the room was buzzing with experienced writers who all knew each other. I stood at the side willing myself to go and talk to someone. Hadn’t I learnt my lesson by now? This project had been all about interacting with strangers- yet I was terrified of just walking up to one in real life and introducing myself. Thankfully, after a few minutes that seemed to stretch forever, a man (who also stretched forever) came and stood next to me. I looked up at his tall figure and suddenly we were having a conversation. His name was Tom and he didn’t know anyone either. He was from Melbourne and making video games was his thing- but he’d written a book just recently (read here). It was a lovely chat and we bonded talking about games. He recommended I play Journey, which I did just the other day and now I never want the game to stop. In Journey- almost everything is your friend- but it’s a very quiet game. This has confirmed something in my mind: That I’ll never be a loud person who is the centre of the party, but if I can continue push myself to talk to strangers and befriend people in my own quiet way- I will get so much more out of things. 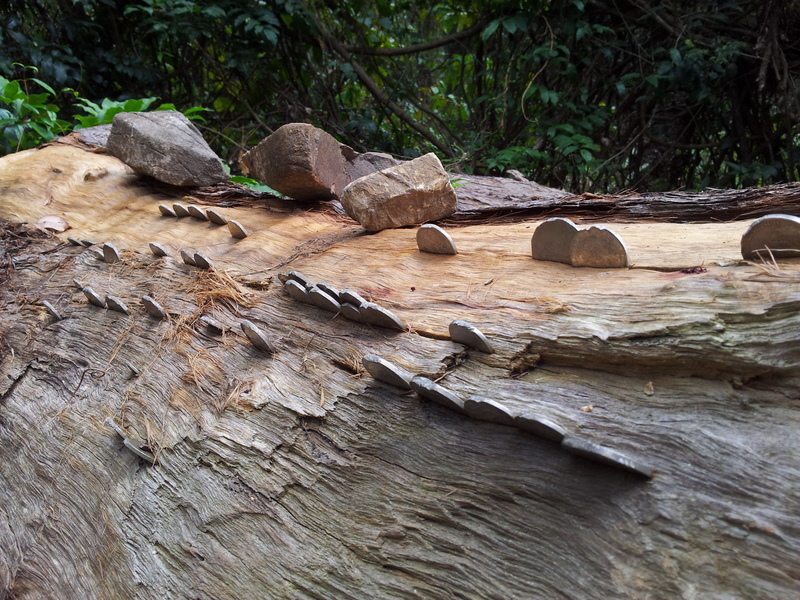 Forests are nice places to reflect, and sometimes you find weird things too- like this log. I realised, before this challenge I would have seen this log and thought it would make a good story “one day” and “one day” would never come. But now, I take a photo immediately without even thinking and start planning how I am going to write about it. It’s a very nice city, I’m lucky to have made it here. But there are no street sleepers, like me. A man walking his dog tells me to go the money tree. I assume it’s just a cruel joke given the state of me but I go there anyway. The park is nice. It’s a huge attraction. People come from all over the world to stick their own coin into it, hoping it will ensure they have a rich life. I don’t even have a coin to stick in it. I see a dad hand his kid a coin. “Now go get me that new car,” he jokes. I decide to join the line. Perhaps just touching it will give me some luck. The boy in front of me looks at me, screwing up his nose at my smell. When I get to the front they don’t turn me away. So I pretend to put in a coin. But as I do I feel coins dropping into my hand. I’ve lived in the city 5 years now and even have my own house. There are no street sleepers because of that money tree. I found out later it is a real money tree. Only those who truly need it can pull the coins from its bark. The government is terrified people will find out so they disguise it as a tourist attraction. Run – Day 304 – Signs You are a Writer? Here’s a confession – I am often sucked into quizzes and the like. I rarely agree with them but I find them to be a pretty good way to reflect on things. I started this challenge in order to become a writer. I’ve always been hesitant to use that word in relation to myself (even after being occasionally paid for it). I didn’t feel I could call myself one if I didn’t write everyday. So I looked at this Buzzfeed “24 Signs You’re a Writer” to see if I could say it yet. At first I panicked, I’ve never wanted or owned a typewriter, I don’t want to live in New York and I really don’t like coffee. But then I came to my senses… my writing does not depend on my implements, country or tastebuds. I think I’m finally comfortable to say I am a writer. Lee didn’t have nikes or a trademark victory move. He asked his mother if one day he could ever be a runner. So, I’ve taken inspiration from another thing I learnt from the memory episode of radiolab about a man with amnesia who couldn’t recognise his wifes face if she walked by, but still recognises her by her embrace. In a room of mirrors, she reflected. Was each reflection identical? Or did they lose something of her with each reflection? There were 10 versions of herself she could see in the mirrors currently, each getting smaller and further away. Meanwhile an even bigger version of herself behind her was watching her in the mirror and wondering the exact same thing. 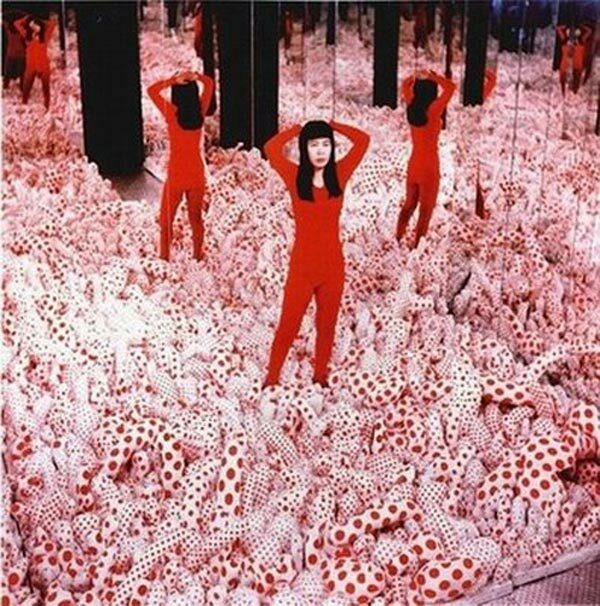 a very apt bit of art from Kusama.